flaws are detected when the pixels exhibit a significant difference between radioscopic and reference images. The threshold values of these methods are carefully optimized in order to minimize false detections while maximizing detection probability. However, by the reduction of false detections, real flaws may be also eliminated and the high quality of inspection may be compromised. In this paper, we address the above problems using a very efficient method, which is based on a two-step analysis: segmentation and correspondence finding. The first step segments potential casting defects in each radioscopic image using a classic method, namely the PXV 5000 developed by YXLON International X-Ray GmbH (successor to German Philips Industrial X-Ray and Danish Andrex). In this step the identification of real defects is ensured while the number of false detections is not considered. The second step attempts to find a correspondence between the segmented potential flaws from image to image. The key idea of this work is to consider as false detections those potential defects, which cannot be corresponded with any other one in the multiple images. The correspondence finding of potential defects in the images follows the principles of multiple view geometry, that is the position of real flaws in the radioscopic images must fulfill some geometric constraints. In order to reduce the computation times, new bifocal, trifocal and quadrifocal tensors, developed recently in the computer vision community, are used to find the correspondence between two, three and four views respectively. Additionally, a linear 3D reconstruction of the center of gravity of corresponding potential flaws is used to exclude impossible 3D points, which do not belong to the space occupied by the casting. The inspection throughput of the method has been verified on real radioscopic images recorded from cast aluminum wheels. Using this method the real defects can be detected with high probability and the false detections can be eliminated. The detection of the real flaws was successful in our labor experiments while the number of false detections were reduced to nil. Radioscopy is increasingly being used as a tool for non-destructive testing in industrial production. An example is the serial examination of cast light-alloy workpieces used in the car industry, like aluminum wheels and steering gears . The material defects occurring in the casting process such as cavity, gas, inclusion, and sponge must be detected to satisfy the security requirements; consequently, it is necessary to check 100% of the parts. Since most defects are not visible, x-ray imaging is used for this task. Over the past decade radioscopic systems have been introduced in the automotive manufacturing industry in order to detect flaws automatically without human interaction [1, 3, 6]. Over the years, they have not only increased quality through repeatedly objective inspection and improved processes, but have also increased productivity through decreased labor. In order to inspect the whole object, radioscopic images at different positions of the casting are taken and processed. The classic image processing methods for flaw detection (see for example [3, 5, 6, 7, 11]) consist of a bank of filters which generate a reference error-free image R, from the taken radioscopic image I, as illustrated in Fig. 1. Flaws are detected at pixels where the difference between I and R is considerable. Using a prior knowledge of the regular structures of the castings, each programmed view is subdivided in several segments to enable the use of the best type of filter for each part of the image. Varying the matrix size and the directions of the mask filters, they can be adapted to the regular structures of the specimen. This procedure is repeated at each programmed position of the casting. Fig 1: Classic image processing method to detect flaws in a casting. The configuration of these methods, i.e. tuning of filter parameters and setting of best views, must be carefully optimized in order to minimize false detections while maximizing detection probability. However, by the reduction of false detections, real flaws may be also eliminated and the high quality of inspection may be compromised. To avoid this problem we propose inspecting castings in two-steps: detection of potential flaws in a radioscopic image sequence of a casting and correspondence finding in different views between the detected potential flaws. The first step detects potential casting defects in each radioscopic image using a classic method. In this step the identification of real defects is ensured while the false detections are not considered. An example is shown in Fig. 2, where two real flaws (and many false detections) were detected using the software PXV5000 developed by YXLON International X-Ray GmbH. Applying this criterion to detect flaws, the parameter tuning of the image processing method is quite simple. In second step we attempt to find correspondences between the detected potential flaws using matching and geometric constraints such as feature comparison and epipolar, trifocal and quadrifocal constraints, developed recently in the computer vision community. The goal of this paper is to discriminate those potential defects, which do not have any correspondence in the image sequence. Fig 2: (a) Two flaws in a radioscopic image of an aluminum wheel (the circles were manually marked). (b) Detection of potential flaws using PXV5000 (see black regions). The paper is organized as follows. Section 2 describes the PXV 5000 algorithm to recognize potential flaws. The correspondence finding of potential flaws in multiple radioscopic images is given in Section 3. The results obtained on radioscopic images are shown in Section 4. Finally, our conclusions and suggestions are presented in Section 5. After the image acquisition by the CCD-camera digital radioscopic images are generated. We take sequences of radioscopic images by rotation of the casting at 5° intervals. The position of the casting, provided on-line by the manipulator, is registered at each radioscopic image. This position will be used in our geometric model. An image sequence is shown in Fig. 3. 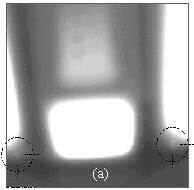 Fig 3: Radioscopic se­quence of an alumi­num wheel. Fig 4: PXV-5000 algorithm to detect flaws. Image grabbing digitizes the TV-input signal from the camera by using an image intensifier. A number of frames is averaged for noise reduction. Using a flat panel detector the detector will be exposed during the grabbing phase for a certain time needed to receive a low noise image. The image is digitized by flat panel itself. Depending on the adjusted image size the grabbed image is shrinked. The image size for standard processing is 256x256, for special processing it can be adjusted. The image registration measures the 2-dimensional position (translation) and the brightness of the image contents. A plausibility test against a reference image of the appropriate position is performed. The measured position deviation is taken into account for further processing steps. The gray level normalization equalizes the resulting gray level contrast of a given defect in different regions (different thickness) of the object. The filtering step emphasizes all image structures, which are suspected to be defects. An ideal filter would filter out defects only. But this is not possible, since irrelevant object structures (regular structures) similar to defects will be enhanced as well. Another dilemma is, that a filtering operator does not produce high output in cases where a real defect is superimposed by some complicated object structure. In order to solve these problems using PXV 5000 two types of filters are available: the so called standard filter, used for homogeneous objects, and special filters for non homogeneous objects with complicated structured areas. The standard filter has been developed at Philips Research Laboratories and will be applied by homogeneous areas. The special filters are based on classical image processing filters and will be used by non homogeneous highly structured areas. PXV 5000 allows the using of seven different filters within one image. The masking step suppresses all irrelevant image structures which lay outside of a processing region mask. The segmentation step produces 2 binary images by simple thresholding. The first is called the marker image. It marks all structures, which are suspected to be defects. The second binary image contains the structures with true shape. The identification step identifies all structures with adjacent pixels. These are called segments. The segments are listed in a so called segment set. The measuring function measures features of all segments in the segment set. Features are: position, area, perimeter, Feret coordinates, compactness, elongation, minimum gray level, mean gray level, maximum gray level. The matching step removes all segments representing regular structures from the segment set. This is done by comparing of the detected segments with the features of segments which are collected in so called segment model. The segment model contains all segments caused by regular structures obtained during a learning phase. The classification step classifies the remaining segments in the segment set according to the inspection specification. An example of this method is illustrated in Fig. 2, where the detected potential flaws of image 5 of Fig. 3 are presented. After the potential flaws in each radioscopic image are segmented, we attempt to track them in the image sequence in order to separate the false detections from the real ones. The tracking consists of two steps: matching in two views and tracking in more views. The geometric model as well as the mathematical background that are used in this work can be found in the technical report . Fig 5: Epipolar geometry in two views. the centers of gravity of the regions must satisfy the epipolar constraint. Epipolar geometry can be useful in finding correspondences between two projections: As shown in Fig. 5, the possible 3D points M that may have caused the projected point x1 in first image are on the beam (C1,x1), where C1 is the location of X-ray source at first projection. Therefore, the corresponding points of x1 are located on the projection of this beam on image 2 by C2, the location of X-ray source at second projection. The epipolar constraint is that, for a given a point x1 in image 1, its possible matches in image 2 must lie on the epipolar line of point x1 [2, 8]. the regions must be similar enough. To evaluate this criterion we calculate a degree of similarity as an Euclidean distance between the feature vectors of the regions. This degree of similarity of the regions must be small enough. the 3D point reconstructed from the centers of gravity of the regions must belong to the space occupied by the casting. Using a linear triangulation technique  we estimate the corresponding 3D point , that may produce the coordinates of the centers of gravity of the regions. We examine if resides in the volume of the casting, which dimensions are usually a priori known (e.g. a wheel is assumed to be a cylinder). We evaluate the matching conditions in all two classified regions in all three consecutive frames of the sequence. If a potential flaw is not matched with any other one, it will be considered as false. Multiple matching, i.e. a region that is matched with more than one region, is allowed. Applying this method the real flaws are successfully matched and a great many false detections have vanished. However, the number of the remaining potential flaws are still to be reduced. In the tracking problem, it is required to find trajectories of regions in different views. The tracking in three views of a flaw using epipolar geometry is simple: if two corresponding points x1 and x2 are matched in image 1 and 2, the corresponding point x3 in image 3 must belong to the epipolar lines of x1 and x2 in the third image. Therefore, x3 belongs to the intersection of these two lines . However, this approach is not well-defined, if the epipolar lines are equal. Additionally, the compute of the intersection cannot be done directly. Shashua introduced the trifocal tensors to solve the correspondence problem in three views linearly [12, 4]. Using trifocal tensors one can directly compute the coordinates of the third image corresponding point from the coordinates of the first two ones (reprojection). x3 is the reprojection of x1 and x2 in third image (xi= center of gravity ri ). x4 is the reprojection of x1, x2 and x3 in fourth image (xi= center of gravity ri). Once again, the no tracked regions are eliminated. Our experience on this problem has shown that a repetition of this procedure for fives views could lead to the elimination of some real flaws. A flaw that appears in more than fours views may be tracked more than one time as different quadruplets. After some simplifications we can resume these corresponding trajectories in a trajectory that contains more than four regions. In this section we present results of automatic inspection of an aluminum wheel using the approach outlined in previous sections. Radioscopic images of an aluminum wheel with known flaws were inspected. The flaws were produced by drilling small holes in positions of the casting which were known to be difficult to detect. The results obtained by the image sequence of Fig. 3 are shown in Fig. 6. Fig. 6a shows the matched regions of Fig 4 (the marked regions are the potential flaws that were detected by PXV5000). Fig 6a:	Matching in 2 views. Fig 6b: Tracking in 3 views. 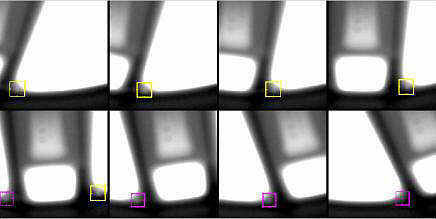 Fig 6c: Tracking in 4 views and detection. Fig 6:Finding correspondence of potential flaws in the radioscopic sequence. After the tracking in four views is achieved our objective: the real defects were separated from the false ones. We summarize our results in Fig. 7. In the segmentation, we observed that the misclassification error rate was 89.7% (878/978). Nevertheless, the efficiency in this experiment was very good, as we were able to segment 100% of all projected flaws in the sequence. In the next steps, the number of false detections were reduced to nil. Fig 7: False and real detections in each step. A new method for automated flaw detection in aluminum castings using multiple view geometry has been developed. Our method is very efficient, because it is based on a two-step analysis: segmentation and tracking. The idea was to try to imitate the way a human inspector inspects radioscopic images: first relevant details (potential defects) are detected, followed by tracking of them in the radioscopic image sequence. In this way, the false detections can be eliminated without discriminating the real flaws. The great advantage of our first step, is the simplification of the tuning of the flaws segmentation method. The second step is greatly efficient in both discrimination of false detections and tracking of real defects, and is not time-consuming, due to the use of the multiple views tensors. The implementation of our method in the industry is nearing completion, the components have been tested in a laboratory prototype and the preliminary results are promising. Together with YXLON International X-Ray GmbH an application for a patent was submitted for the second step of this method [European Patent Application Nr. 00102507.1.] . However, since the performance of the method have been verified on a few radioscopic image sequences, an evaluation on a broader data base is necessary. The authors are grateful to the German Academic Exchange Service, DAAD, and YXLON International X-Ray GmbH, Hamburg, for their support. Boerner, H.; Strecker, H.: Automated X-Ray Inspection of Aluminum Casting, IEEE Trans. Pattern Analysis and Machine Intelligence, 10(1):79-91, 1988. Faugeras, O.: Three-Dimensional Computer Vision: A Geometric Viewpoint, The MIT Press, Cambridge MA, London. 1993. Filbert, D.; Klatte, R.; Heinrich, W.; Purschke, M.: Computer aided inspection of castings, In IEEE-IAS Annual Meeting, Atlanta, USA, 1087-1095, 1987. Hartley, R.: Multilinear Relationships between Coordinates of Corresponding Image Points and Lines, Proceedings of the International Workshop on Computer Vision and Applied Geometry, International Sophus Lie Center, Nordfjordeid, Norway, August 1995. Hecker, H.: Ein neues Verfahren zur robusten Röntgenbildauswertung in der automatischen Gußteilprüfung, Dissertation am Institut für Allgemeine Elektrotechnik, Technische Universität Berlin, 1995. Heinrich, W.: Automatische Röntgenserienprüfung von Gußteilen, Dissertation am Institut für Allgemeine Elektrotechnik, Technische Universität Berlin, 1988. Kosanetzky, J.; Putzbach, H.: Modern X-Ray Inspection in the Automotive Industry, proc. 14th world Conference of NDT, Dec. 8-13, New Delhi, 1996. Mery, D.; Filbert, D.: Epipolar Geometry in Radioscopic Images, Computerized Tomography for Industrial Applications and Image Processing in Radiology, DGZfP Proceedings BB 67-CD: 181-187, March 15-17, Berlin, Germany, 1999. Mery, D.; Filbert, D.: Flaw Tracking in the X-Ray Automated Inspection of Aluminum Castings, Technical Report 189, Institute for Measurement Technology and Control Engineering, Technical University of Berlin, November, 1999. Mery, D.; Filbert, D.: Verfolgung von Gußfehler in einer digitalen Roentgenbildsequenz, tm - Technisches Messen, 67( 4): 160-165, 2000. Schulenburg, H.; Purschke, M.: Advances in the Automatic Evaluation of Radioscopic Images, Computerized Tomography for Industrial Applications and Image Processing in Radiology, DGZfP Proceedings BB 67-CD: 241-243, March 15-17, Berlin, Germany, 1999. Shashua, A.: Trilinear Tensor: The Fundamental Construct of Multiple-view Geometry and its Applications. International Workshop on Algebraic Frames For The Perception Action Cycle (AFPAC), Kiel Germany Sep. 8-9, 1997.